Click the chart for more bond market data. The 10-year Treasury yield briefly rose above 2% for the first time in nine months Monday, as investors sold government debt following an encouraging report on durable goods orders. "There's a sense that the economy is getting healthier, and the durable goods numbers were bearish for Treasuries," said David Coard, head of fixed income trading at The Williams Capital Group. Data from the Census Bureau showed that orders for big-ticket items ranging from vehicles and aircraft to machinery, computers and appliances rose 4.6% in December, much higher than the 1.6% rise forecast by analysts. Even excluding transportation goods, orders were up a healthy 1.3%. The better-than-expected reading lifted the 10-year Treasury yield to just above 2% up from 1.95% late Friday. That was the first time the benchmark yield crossed the psychologically important 2% mark since April 2012. But the uptick was brief, and yields eased back to between 1.98% and 1.99% in afternoon trading. 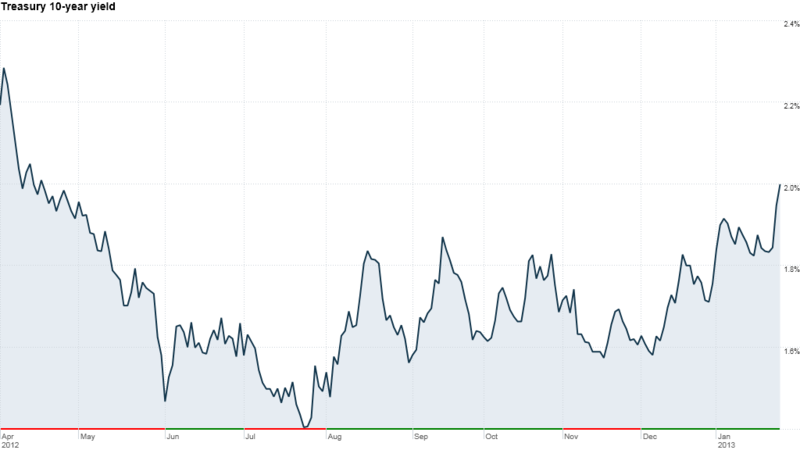 The yield on the 10-year note has been steadily rising since the start of this year, as chatter about the threat of rising interest rates and the burst of a bond bubble continue to build. But it may take a bit more time before yields are able to sustain that upward momentum, notes Coard. He argues there's still a lot more economic growth needed before yields will be supported at higher levels. "The key to a sustainable economic recovery depends on the job growth," said Coard. 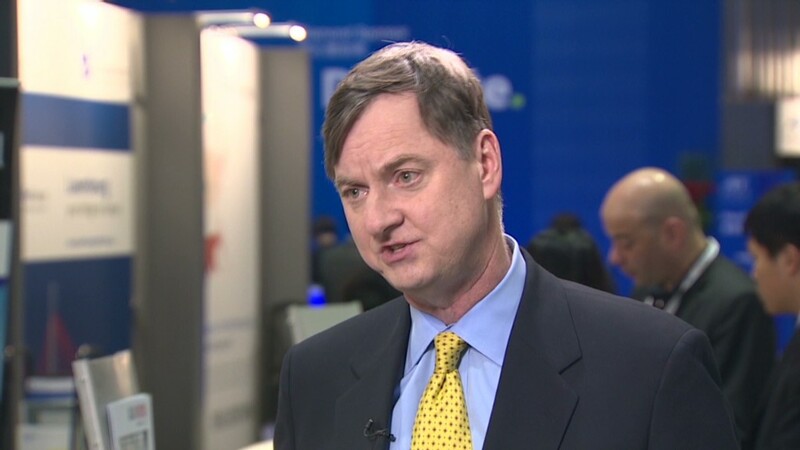 "We need to see much stronger hiring before we have to worry about yield backing up." The monthly jobs report, due Friday, is expected to show that the economy gained 180,000 jobs in January, according to analysts polled by Briefing.com. In order to significantly bring down unemployment, economists say the country needs to create at least 200,000 jobs a month or more. In 2012, there were only four months when that occurred. Coard also points out that uncertainty around the debt ceiling debate and Europe's ongoing debt challenges will likely keep a lid on Treasury yields. "If we have another stalemate in Washington or see Europe's crisis rear its ugly head again, there could be a strong rally in Treasuries," he said. "There are so many things facing us down the road that could really derail the recovery, which is not exactly going gangbusters." In fact, Coard said the potential potholes on the road to recovery may even push the 10-year yield near its record low below 1.4%, hit last July. The Federal Reserve's bond-buying programs has also been keeping yields low, but the minutes from the Fed's December meeting showed that some members were weighing whether the central bank should wrap up its bond buying program before the end of this year. The Fed's first meeting of the year on monetary policy is later this week, and investors will be waiting to hear whether the central bank has any additional guidance on the length of its program.